Montana is well known for its outdoor recreation opportunities - especially for fly fishing. 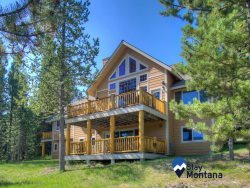 With our riverfront vacation rentals, fly fishing Montana has never been easier. We have a number of properties that offer convenient access to some of the best fly fishing spots - perfect for your next getaway. Take advantage of our prime fishing location and all of the local resources. We even make it easy to celebrate the catch of the day - fire up the grill! Even if you arent an avid fisher, our Riverfront Properties are sure to impress for the great views, beautifully designed interiors, and premium amenities. Let the day wind down around the fire pit, watch the sunset from the deck, or cozy up in front of the flat screen TV for a movie. Find yourself lulled to sleep by the sound of the river outside your window, and enjoy a peaceful morning along the shore. There are plenty of nearby hiking trails and lots of other outdoor adventures right at your fingertips. We know that accommodations are a huge part of your vacation experience, and we take pride in our thoughtfully designed homes where guests can truly relax. We aim to make the booking process simple and stress-free and our rentals well equipped, so that you can feel at home and focus on what is important - making memories.